Description of "The spring at the streets and other poems "
These poems will make you fall in the book of imagination. There are Nature , love , Night , Horror and moral poems .The poet who is 14 years old, that he have written in such a way that's make the reader read poems in a fun and interest read. Tanish Gupta as a nickname of Steven Nikbon. He was born in a small town Rudrapur, India in 20 August, 2002. Nikbon is also very young as a poet he is just 12 years old when we started writing short stories and poems. He published his first poetry book at the age of 14. He studies in confluence world school. 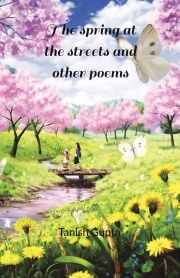 Reviews of "The spring at the streets and other poems "
A really great poetry book. Best book I have ever read a great poet and writer Steven Nikbon. Poems like the peacock,dribble the missile have great meaning many other poems are also great.